Can an HBL details be changed after releasing from Shipping Carrier of Goods? How to amend HBL after submitting original HBL with bank? Can a HBL be amended at port of destination? Under this article, I am going to explain about the procedures and formalities to amend House Bill of Lading. HBL - House Bill of lading is issued by a freight forwarder who acts as a carrier on receipt of goods from shipper after completion of necessary export customs formalities. Once after releasing House Bill of Lading, HBL with other shipping documents are submitted to bank in turn to overseas buyer. Normally, once after releasing house bill of lading, the supplier sends a copy to consignee electronically, either by mail or fax. The exporter comes to know the discrepancy in house bill of lading once after releasing HBL from the carrier. If the discrepancy in House Bill of lading found before submitting documents with exporter’s bank, the amendment can be done by submitting all originals with the freight forwarder at load port who issued HBL. The freight forwarder who carries goods can amend house bill of lading only on the basis of export shipping documents authorized by customs authorities. 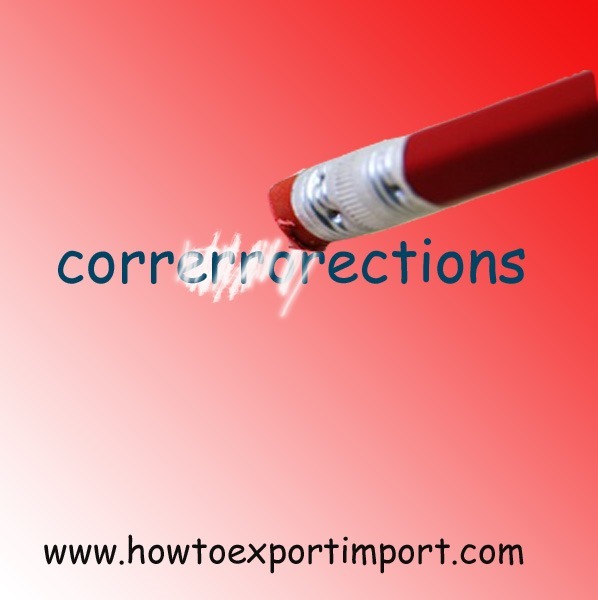 So, if any details of addition, deletion, or correction is subjected to the declaration by exporter in shipping documents. 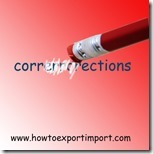 If correction details do not match with export shipping documents, the carrier cannot include such details in bill of lading. In such cases, exporter or his customs broker need to amend the said shipping documents with customs first and after completion of such amendment in shipping bill, he can approach freight forwarder to amend House Bill of Lading accordingly. If an amendment is required once after submitting original house bill of lading with shipper’s bank, the overseas buyer can amend the said original bill of lading once after receiving HBL from his bank through shipper’s bank. At this time, the consignee needs to approach the freight forwarders counterpart office at consignee’s location. The carrier (freight forwarder) at consignee’s location needs a ‘No Objection’ letter or message to amend house bill of lading from his counterpart at load port who issued HBL. In turn, the freight forwarder at load port confirms the details to his counterpart at destination regarding amendment of HBL. The freight forwarder at load port provides ‘no objection’ up to the extent of information available in export shipping bill submitted by exporter. If consignee needs to amend any details other than the details declared in export shipping bill, the exporter (shipper) can amend shipping bill at load port with customs and submit such amended shipping bill with freight forwarder, so as to enable him to send a ‘no objection’ to amend such details in house bill of lading. Here I have explained about the procedures and formalities to amend House Bill of Lading. I have also explained amendment procedures before submitting original HBL with bank and after dispatch of HBL to overseas buyer. You can add below more information of you would like to. Do you have experience in amending House Bill of Lading during your import export career? Share below your experience in amending House Bill of Lading. Comment below your thoughts about this article – How to amend House Bill of Lading? Ankit: On 29 March 2017 I have one question to change in HBL. e.g My shipment reached to destination port since last 4 to 5 days, now buyer refuse the cargo. I have one another buyer (in same country, same place) who is ready to take the material/cargo. Is it necessary to collect NOC from first buyer to change consignee details in HBL. As per my knowledge due to House BL NOC is not required by first buyer (And my first buyer also don't agreed to send me NOC). I need your suggestion also. Nelson gallo: On 15 March 2018 Let me update some information regarding shipments topic.